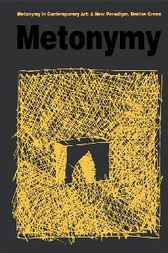 In Metonymy in Contemporary Art, Denise Green develops an original approach to art criticism and modes of creativity inspired by aspects of Australian Aboriginal and Indian thought. Interweaving her own evolution as an artist with critiques of Clement Greenberg and Walter Benjamin as well as commentary on artists such as Joseph Beuys, Mark Rothko, Frank Stella, and others, Green explores the concept of metonymic thinking as developed by the poet and linguist A. K. Ramanujan and its relevance to contemporary painting and aesthetics.In Ramanujan's formulation of metonymic thinking, the human and natural worlds are intrinsically related to one another as are the transcendent and mundane. When applied to contemporary art, metonymic thinking implies that one must understand that the creativity of the artist flows from a fusion of an inner state of mind and the outer material world. Pointing out how this alternative aesthetic and cognitive mode is left wanting in art criticism, Green argues for a critical discourse and interpretive mode in contemporary art that is at once global and pluralist in perspective.